The Trump administration's decision to halt expedited processing of H-1B visas could abruptly disrupt the plans of thousands of immigrant workers in a range of businesses from technology to health care, immigration experts say. H-1B visas allow employers to bring in skilled foreign workers; about 85,000 will be given out this year. The visas are in high demand and given out by lottery. It can take six months or longer for an application to be reviewed. But the government announced Friday that, as of April 3, it will suspend the "premium processing" option, which ensures an application will be reviewed within 15 days. It costs $1,225. Trump has accused companies of abusing the H-1B program as a way to hire foreign workers who take jobs away from Americans, at lower salaries. The Trump administration says it's doing away with quick-turn processing so it can sort through a large backlog of applications and try to "reduce overall H-1B processing times." Immigration lawyers said Saturday that the change will leave many people and companies in limbo. "The message specifically mentions they want to bring down the backlogged time, but I worry about my clients, employers and individuals who will be affected by these delays," said Tahmina Watson of Watson Immigration Law. "This suspension is not good for American businesses by any means." Watson said "I strongly suspect delays will continue." H-1Bs are at the center of controversy as President Trump vows to deliver on campaign promises to reduce immigration. There are several efforts in Congress to change how the H-1B program works. One bipartisan bill would reform the program by instructing officials to grant visas on merit, rather than through lottery. Neil Ruiz, executive director of the Center for Law, Economics and Finance at George Washington University, said the Trump administration's decision to stop expedited processing could be the first step away from the lottery system. 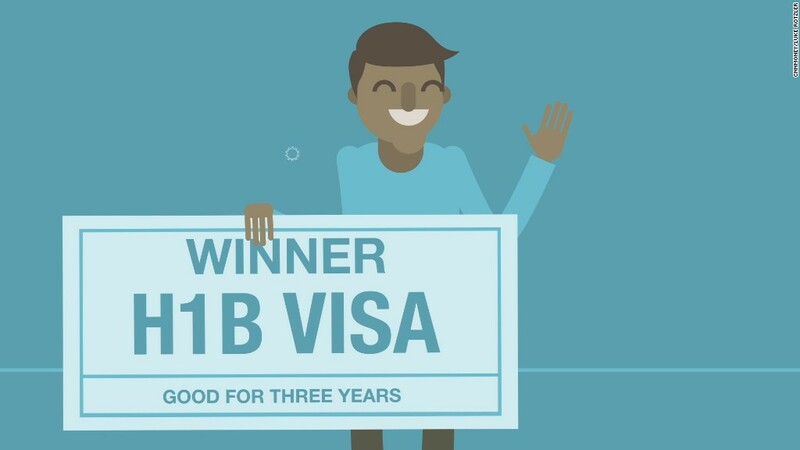 "I think that removing premium processing may allow the administration to pick who to prioritize in the wait times for H-1B visas," Ruiz told CNNMoney. Watson called the move a "big deal" because certain "employers and individuals require premium processing in certain situations." Without it, she said, employers can't "plan for their businesses and act accordingly." Some areas of rural America, as previously reported by CNNMoney, rely heavily on immigrant medical professionals. Thousands of doctors from abroad need H-1B visas to continue working in the U.S. after the expiration of their J-1 visas -- which permit them to complete a residency program. Each year, more than 6,000 medical trainees from foreign countries participate in medical residency programs through J-1s, according to the American Association of Medical Colleges. For many doctors, time is of the essence. Once they complete their residency, physicians can either return to their home country for two years before becoming eligible to reenter the U.S. through a different immigration pathway, such as an H-1B visa, or they can apply for a J-1 visa waiver. In the last 15 years, H-1B visas have allowed 15,000 foreign doctors to come to American to work in underserved communities. "The lack of premium processing would mean that there would be a delay for the doctors to start working in the communities they wish to serve, which have a lack of physicians in the first place," said Ahsan Hafeez, a doctor who is in Pakistan awaiting approval of his H-1B so he can begin working in Arkansas. It's not just the medical profession that relies on expedited processing of H-1Bs. The visas are a staple in Silicon Valley. Large firms say they need the visas to bring in engineers and other high-skilled workers they can't find in the U.S. The elimination of expedited processing will leave tech companies in limbo about the status of critical employees, said Bay Area immigration attorney Martin Lawler. "When you're planning a project, you want to make sure you have the necessary people and skills to get it out on time," Lawler said. India, home of many skilled immigrants who come to the U.S. on H-1B visas, is bracing for an economic impact. Local news reports have already cautioned that the change by the Trump administration will likely take a toll on IT companies next quarter. It's common for Indian IT companies to send workers to America at the last minute to work on projects. H-1B visas are used by all manner of foreign workers -- journalists, entertainers, professors and researchers. Any could be hurt by a delay in visa processing. But longer wait times could "be particularly harmful" for students, said Watson, the immigration lawyer. That's because graduating students who are in the U.S. with a different type of visa -- such as a J-1 or F-1 -- cannot stay while their H-1B status is pending, she said, and they can't start working. They have to return to their home country while awaiting approval. Now those waits could get even longer. Watson said the backlog of standard process cases is so large that officials are currently looking at applications submitted in July 2016.